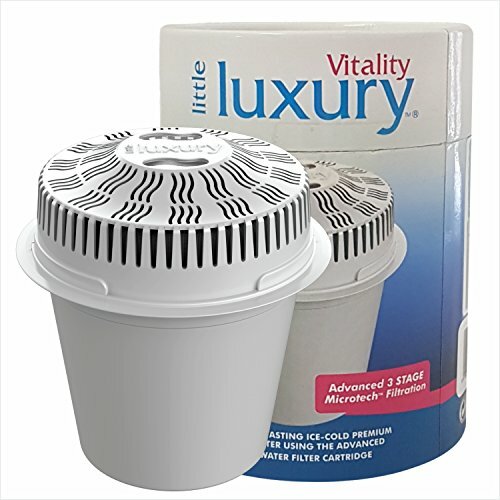 Little luxury mini water replacement filter little luxury is a revolutionary filtration and cooling system. Quench your thirst anytime and anywhere with great tasting filtered water from the little luxury indoor series water cooler and filter. This premium award winning mini cooler and filter turns regular tap water into ice cold, thirst-quenching, filtered water using our proprietary high quality filters. Our filters use superior quality and highly absorbent carbon and provide huge savings with the filtered water only costing approximately 12 cents/gal. The replaceable filters are made from food grade materials and are tested and certified by nsf and sgs laboratories. They remove most contaminants and impurities that one would want out of their drinking water whilst maintaining the important minerals one would want to preserve. The vitality filter is a proven robust replaceable water filter cartridge tested by nsf and sgs that removes most heavy metals, impurities and contaminants commonly found in city tap water whilst preserving the important minerals not found in bottle water. The filters also remove fluoride. The vitality filter has a patented design with feather edge and silicon seal ensuring no water can pass without being filtered. The vitality filter is exclusive and compatible with the vitality indoor series 1.8Gal water dispenser filtration system. The vitality filter can filter up to 100 gal of city or municipal tap water and is tested to 200 gal. If you have any questions about this product by Little Luxury, contact us by completing and submitting the form below. If you are looking for a specif part number, please include it with your message.